Intro to Fractions. I realize that fractions are not necessarily everyone's favorite topic. 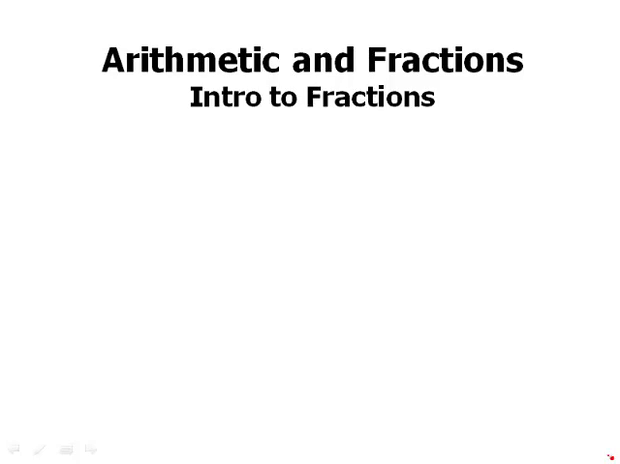 I hope to convince you during the course of the rest of this module that you can actually do fractions. You can make sense of this topic. Let's start at the beginning. Here's a number line with a few fractions. Of course most of the fractions fall between the integers. Notice that fractions can be positive or negative. Also, there are an infinite number of fractions between any two integers. So between, say, one and two, there's an infinity of fractions. We won't spend a lot of time on this idea, but it's just an important perspective to have on some of the things the test will ask about fractions. So, all three of those are perfectly equivalent and interchangeable. And we could switch back and forth freely between them. Sometimes people get really locked up, they think that, that negative sign has to sit in one place and can't move. Well no, all three of these are equivalent, you're free to move that negative sign around. So, the, the test will actually expect you to have that fluency. So let's talk about some terms. Suppose we have the fraction 3 over 16, what do we call the place where the three is sitting and where the 16 is sitting? The top part, the upstairs of a fraction is the numerator. This fraction has a numerator of 3. The bottom part, the downstairs, of a fraction is the denominator. This fraction has a denominator of 16. Two ways of thinking about a fraction, well first of all we can think of it as division. Two sevenths means two is divided by sevens, so there's an actual arithmetic operation occurring. The second one is more a visualization. And it's actually very important to cultivate both of these, because these employ different sides of your brain. And if every time you look at a fraction and you think both of the division as well as the diagram, then you're going to be using both sides of your brain, and you're gonna be understanding fractions much more deeply. For fractions such as 35 over 5 it's useful to think about the fraction as division because that division we can actually perform. 35 divided by 5 equals 7. Notice that 35 over 5, that, in every way, is an equivalent way to write the number 7. When we write 35 over 5, we are writing the number seven in kind of a hidden form. We're saying that those two have exactly the same, mathematical value, even though they look very different. In fact, one way to see what's going on here, we can write the 10 and the 15 as products. 2 times 5 over 3 times 5. In other words, the numerator and the denominator of the original fraction, both got multiplied by the same factor. Essentially, we're multiplying the fraction by 4 over 4 which equals 1. As we can multiple both numerator and denominator by the same factor, we can also factor out the same positive integer from both the numerator and the denominator. So for example, suppose we have 6 over 42, well we could multiply. We can express both of those as products, 6 times 1 over 6 times 7. And then, we can get, we can factor out those six, and cancel them, and get down to 1/7ths. The sixes cancel. Notice that canceling is a form of division. That's very important. Canceling is a form of division. Some folks have a have misconceptions about cancelling. Cancelling the common number in the numerator denominator does not merely quote go away. A lot of people have this sloppy way of talking about it. The sixes go away. That's not a very healthy way to think about this, it leads to mistakes. For example, suppose we had 8 over 40, we wanted to simplify it. We'll clearly, we can divide, we can cancel the eights. So 40 divided by 8 is 5. That gives us the denominator. Well people were stuck on the, the concept of eights go away. Well then they wonder what happens in the numerator. What if the eight goes away, what's left in that numerator? Instead of thinking at of it in terms of the eights go away, we cancel the eights. That is to say we divide by the eights, and 8 divided by 8 is 1. The eights don't go away. They divide, 8 over 8 to equal 1. This is a crucially important idea for anyone who previously has been using the go away understanding of cancelling. Well why? First of all it will make all your calculations much easier because you'll be dealing with smaller numbers. On the GRE multiple choice, the answer choice listed will almost always be in simplest form. So you'll have to simplify the simplest form in order to find something that matches the given answer choice. On the numerical entry, you can enter a non simplified fraction, as long as it fits in the box. Still it's a good idea to practice simplifying though, because simplifying along the way may make your calculation easier so there it still will be helpful. Practice writing these factions in lowest terms. Pause the video here and then we'll talk about these.
. Okay, here are the answers. The last big fraction topic for this video is how to handle fractions that are greater than one. If we have a fraction greater than one, we have a choice about its form. We can write the fraction as either an improper fraction, that is to say a fraction in which the numerator is larger than the denominator- That's what it means to be an improper fraction, the numerator is larger than the denominator. Or, we can write it as a mixed numeral, that is to say, something that is part integer and part fraction. So for example, we could say five thirds equals one and two thirds. Five thirds is an improper fraction. One and two thirds is the mixed numeral of the same numerical value. And that's why we can put an equal sign between them. So when we write, four and three fifths, what we actually mean, we don't have to write it, but what that actually means is 4 plus three fifths. This makes it easy to change from a mixed numeral to improper fraction form. Write the mixed numeral as addition and then multiply the integer by c over c, where c is the denominator of the fraction part. So, for example, we'll start with four and three fifths. We'll write that as 4 plus three fifths. Now we're going to multiple that 4 by 5 over 5, and of course we're allowed to multiply by 5 over 5 because that equals 1. And that will give us 20 over 5, plus 3 over 5, and those add to 23 over 5. That is the improper fraction form that is equal to the mixed numeral four and three fifths. Sometimes a test problem will give all the answers in either mixed numeral or improper fractions form. So, either one could appear on the test. Notice that if you have a choice, improper fractions are almost always more efficient for calculations of all sort, than are mixed numerals. Unless the problem forces you to use mixed numerals, you'll be better off changing everything to improper fractions. In summary, we talked about the basic fraction terms and how to think about fraction, the division way of looking at it versus the pie method. We talked about the important idea of equivalent fractions. We talked about how cancelling is a form of division, it doesn't mean go away, it means we're actually performing division. We talked about the importance of learning how to put fractions in lowest terms, also known as simplest form.